The G.V of 1918 was designed to overcome earlier shortcomings, carrying three times the bomb load of the G.II. The end of the war prevented it from becoming operational and it was AEG's last bomber. After the war a number of G.Vs were operated as six-passenger civil transports by Deutsche Luft-Reederei - an airline company financed by and connected with AEG. In fact the G.V in 1919 was the only large German 1914-18 aircraft employed commercially to any great extent. 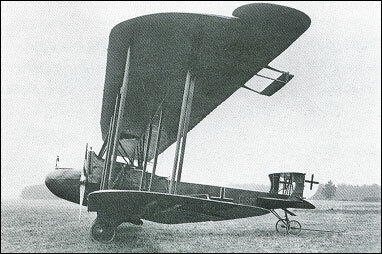 Following early use of the bomber as a makeshift transport (with an open cockpit for passengers) a Limousine version was developed. This had a new cabin fairing attached to enclose the passenger area, a downward-hinging fuselage nose to provide a baggage locker (which could also act as a buffer if the aircraft overturned) and a toilet aft of the cabin. Nice update Barry. I was confused as to the application of this aircraft and if it actually succeeded the G.IV. I can't find any production figures for this aircraft and according to another source none were ready for combat when the armistice was signed. But if you have production figures I would be happy to hear them. Powered by 2 Mercedes D IV engines developing 275 H.P. each, as noted this was the last bomber produced by AEG and for that matter by Germany at the end of World War I. As rightly noted these machines were converted into passenger craft and flown by the nascent DLR, Deutsch Luft Reederei. However, even with a limousine added for passenger comfort, they did not last long in service. The Swedish government broke the Allied war commission rules and bought 7 of the machines, 3 of which crashed on the delivery flight, one fatally. The Swedish army did not have a real use for them, although they may have made some reconnaissance flights with some of them. What they really wanted was the Mercedes engines which after breaking up the AEG bombers they salvaged for their own FVM S18 reconnaissance plane!